Jakarta Library and Archives Department (Dispusip) initiates #BacaJakarta movement at Kebon Sirih Children-Friendly Integrated Public Space (RPTRA), Central Jakarta. It is applied within 30 days, starts from April 1, 2019.
" 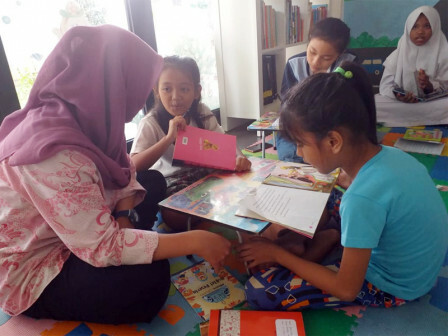 We want to enthuse our children in reading and prevent them from using gadgets excessively"
According to Kebon Sirih RPTRA Administrator, Farida, #BacaJakarta movement is a program that encourages children between 7-12 years old to read together in RPTRA. Kebon Sirih RPTRA itself has 6,000 book collections. Children can choose books on their own based on their interests. "We want to enthuse our children in reading and prevent them from using gadgets excessively," she stated, Monday (4/8). Based on Beritajakarta.id monitoring on the field, there we re 10 children who read together accompanied by two literacy volunteers in Kebon Sirih RPTRA. Farida said, children often visit Kebon Sirih RPTRA after school or around 1 PM. Children at age 7-9 years old are instructed to read minimal 15 minutes per day and age 10-12 years old to read minimal 30 minutes per day. "After reading session is over, we ask them to make a review about things that they have read. Then we collect their work, stamp it, and choose the best review," she explained. One of the children, Naisaroh (12) is often joining this #BacaJakarta program. "It is fun, many of my friends also join this activity," she said. The others, Salsa (12) admitted to have hobbies of writing stories and reading. "I like to read textbooks, comic, folklore stories, and fairy tales," she mentioned.